In order for us to print the project exactly how you need, all fonts must be embedded in your PDF file. Please package all fonts with the InDesign file. To do this, go to File > Package and follow the prompts and check each category to make sure you’re packaging the file correctly. Embed all images and text in illustrator files. These elements are needed to open and work with the file. Please note, certain fonts have copyright restrictions and will not be allowed to be embedded in your PDF file. You may have to create outlines of these fonts instead. To do this, you often go to Type > Create Outlines in the top menu. Color is important to printing, right? Yes it is! To ensure your project is produced the best it can be, please check your color settings prior to submitting your work. Most color artwork is going to be in 4-Color, also called “Process Colors”. The 4 colors stand for; Cyan, Magenta, Yellow and K Black (Black is referred to as “K”). These jobs use pleasing colors that do not require a specific spot color (PMS Color). If you do not convert your files and images to 4-Color/CMYK our process will convert the colors for you. This process can be tricky and if your brand is color conscious, you may get unwanted results. A PMS color is sometimes used to ensure cohesive color throughout pieces and mediums. These are also called “Spot Colors” because they are a solid color, not made up for the 4 other process colors. Jobs using 1 or more PMS colors often cost more and are for brands strict on their color brand guidelines. Greyscale is a solid black that is used to create a variety of tones. Even if the rest of your document is in 4-Color, you want all images that are black to maintain greyscale so you don’t see fragments of color around the black-only image. Ready to send your files but unsure of what we need? Here’s a handy checklist to help you rest easy that your job will run smoothly. Do you have a print-ready PDF including bleed? Does your packaged file include fonts? Are all your colors in 4-color or PMS colors? Are all your black and white images in greyscale? 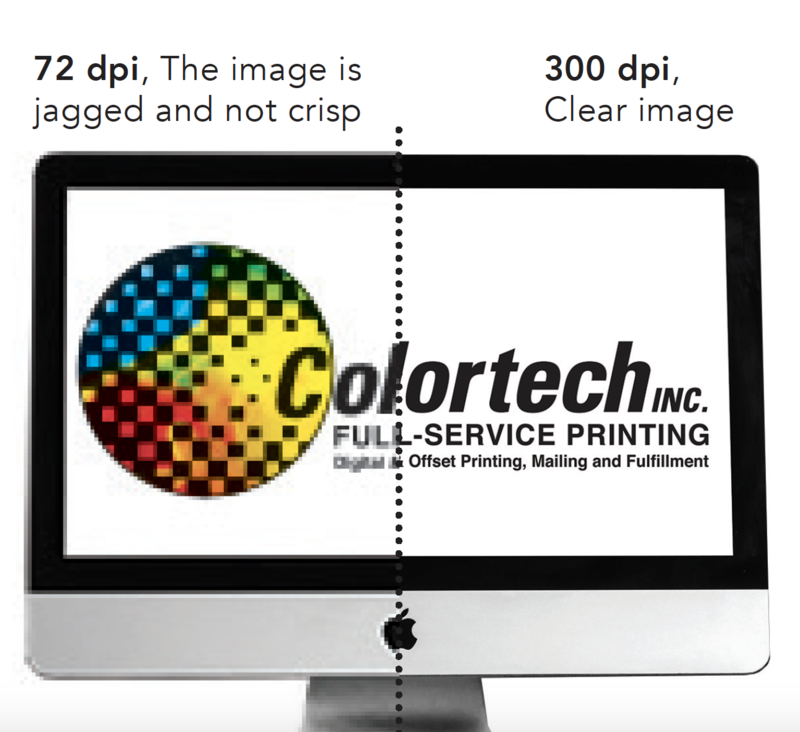 All files and links must be provided at a minimum of 300 dpi (dots per inch) resolution. Most images from the web are designed at a 72 dpi and will not print at their best. If images are not 300 dpi there could be a substantial drop in image quality. What is the best file format for printing digital and offset? We ask that all submitted work contain a print-ready PDF with bleed & single pages and if possible, working files (in-case you request us to make a change). To package a file in InDesign go to File > Package (make sure your links, fonts, etc. are all selected), then save your file. What is it, and why do I need it? Bleed ensures the continuation of color, images and design past the final trim size to prevent imperfections from possible cutting shifts. Please build your print-ready files with the appropriate bleed. We require ALL pieces to have at least .125” (1/8”) of bleed on all sides. We will automatically trim the bleed of f the edge, resulting in your desired trim size.